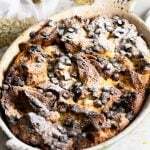 Full of festive, warming spices and studded with chocolate chunks this panettone bread pudding is Christmas on a plate. It's the perfect way to end a meal or cosy up with something warm and comforting. Serve with a dollop of fresh whipped cream and a little nip of your favourite liqueur. Preheat the oven to 350F (180C). Roughly chop the panettone into large cubes and add them to a baking dish. Make sure to fill each space with a piece of panettone and press them down to pack the dish tightly (photos 1-3). Sprinkle over some creme brulee liqueur (or liqueur of choice). In a bowl whisk together the eggs and sugar until combined. Pour in the cream, milk, cinnamon, vanilla and orange zest then mix to combine (photos 5-8). Pour the creamy mixture all over the panettone then leave it to soak in for 5 minutes. Brush with melted butter and finally, scatter over some chocolate chunks or chips and bake in the oven for 40 minutes (photos 9-12). Once it's baked let it stand for 5 minutes, dust with powdered sugar (icing sugar) then serve in bowls with some fresh whipped cream. * 150ml of milk measures exactly as 2 and a half 1/4 cups but you can use 2/3 of a cup which is slightly over but will still work ok.
You can half this recipe to make a smaller bread pudding or to use up leftovers. I used dark chocolate chunks because they aren't overly sweet but you can use any kind or chunks or chips you like. If you don't have full-fat milk you can use semi-skimmed (half fat). You can also top with nuts such as unsalted pistachios or hazelnuts. The pudding is best served immediately but can be reheated the next day. Serve with fresh whipped cream or ice cream. I don't add any sugar or flavourings to the cream because the panettone bread pudding is sweet enough and full of chocolate and fruit it's nice to have something fresh alongside it but of course, you can also serve it just as it is.